First lady Michelle Obama gives the "Gator Chomp" to students as she speaks to a rally in Gainesville, Fla., Monday, Sept. 17. 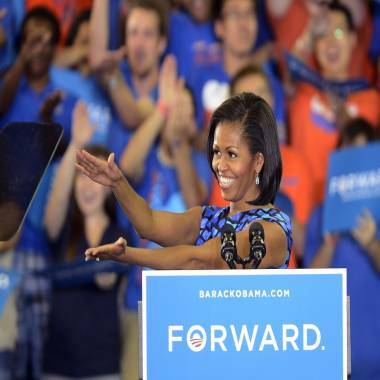 TALLAHASSEE, Fla. -- Rallying the college vote, first lady Michelle Obama commended the "energy and passion" of young voters during stops in Florida Monday -- and cranked the pressure up, too. "All of the progress we've made, it is on the line," Obama said inside a packed arena on the campus of Florida State University in Tallahassee. "As my husband has said, this election's going to be even closer than the last one," she added. "And it could all come down to what happens in a few key battleground states. Yes -- like Florida. And folks here in Florida, you all know a little something about close elections, don't you?" It wasn't Obama's first reference to the George W. Bush era. Earlier, she implored the crowd not to "turn around and go back" to economic policies that she said "got [the United States] into trouble in the first place." Florida is clearly part of that mission. The First Lady's visit may be an indication that whatever ground President Barack Obama has gained here and in other battleground states is going to be guarded closely. An NBC News/Wall Street Journal/Marist poll last week showed the president holding a lead of five points on Republican nominee Mitt Romney among likely voters in Florida and Virginia, and a lead of seven points in Ohio. "From now until November the 6th, we're going to need every single one of you to work like you've never worked before," Obama said. She urged students to take advantage of early voting in order to volunteer on election day. Hours before the first lady arrived in Tallahassee, a flap blew up over a surreptitious video that captured Romney at a fundraiser this year, telling donors that supporters of Barack Obama are "dependent upon government." Obama didn't mention the controversy here in Tallahassee, and instead painted a broad picture of values she said she and her husband share. "You have to be driven by the struggles, hopes and dreams of all of the people you serve," she said. "As president you need a strong inner compass, a core commitment to your fellow citizen, that’s how you make the right decisions for this country. That’s what it takes to be a leader." Late Monday, Romney said during a press conference that his remarks were not "elegantly stated" but reflect his philosophical differences with the White House. "This is something I talk about a good deal in rallies and speeches and so forth, which is the president and I have very different approaches to the future of America," Romney said. Obama campaign officials estimated 8,850 people showed up in Tallahassee. Earlier Monday, the first lady addressed students on the campus of the University of Florida, in Gainesville.